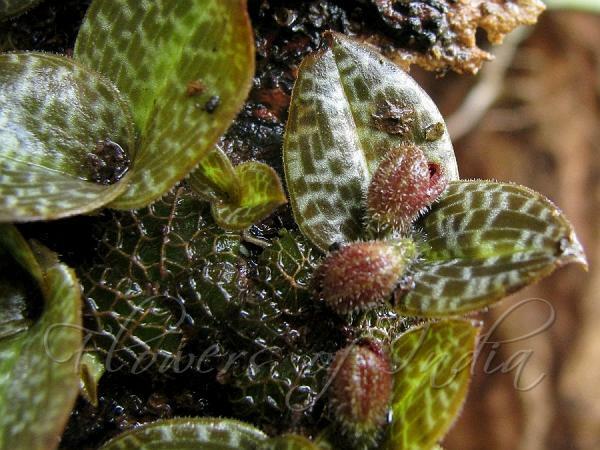 Jerdon's Porpax is a very small rock-growing orchid with endangered species status. It is found on moist rocks associated with mosses in S. India and North Andaman. Pseudobulbs are button-like, 1-2 cm, crowded, covered with fibrous network. Leaves are two, oppositely arranged, ovate, 2-4 cm long, beautifully patterned. The pair of leaves look like a butterfly. Flowers arise 1-2, on a short stalk, from top of the pseudobulb. Capsules are small, ribbed. Identification credit: Shrikant Ingalhalikar Photographed at Anmod Ghat, Karnataka.